“The cities in the Ruhr Metropolis are working together” is the key issue of the polis magazine edition 1 / 2011 with the title “The Awakening Hercules”. Michael von der Mühlen, city manager of Gelsenkirchen, has written an article about the culture of collaboration between the major of the 53 cities within the Ruhr Area. 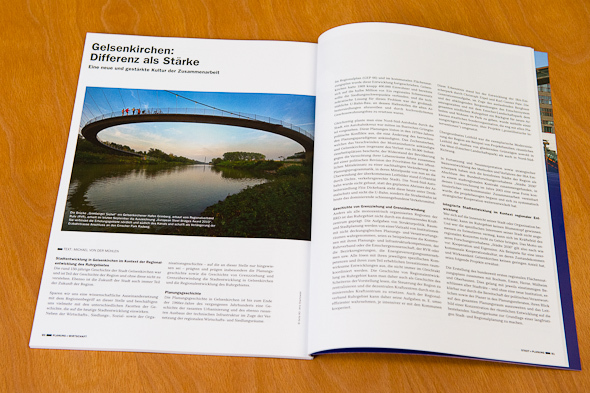 He used my photograph from the “Grimberger Sichel” (Grimberg Sickle) to express the main idea of his article: Since more then 20 years city planners and politicians are working on building interurban bridges of understanding and are trying to work together to build up the the Ruhr Metropolis. Nowadays those efforts come to fruition. The brigde is located near the Grimberg Harbor in Gelsenkirchen. It was designed by the engineering office Schlaich Bergermann and Partner from Stuttgart and was built by the Regional Association Ruhr (RVR). It was awarded the “European Steel Bridges Award 2010”. 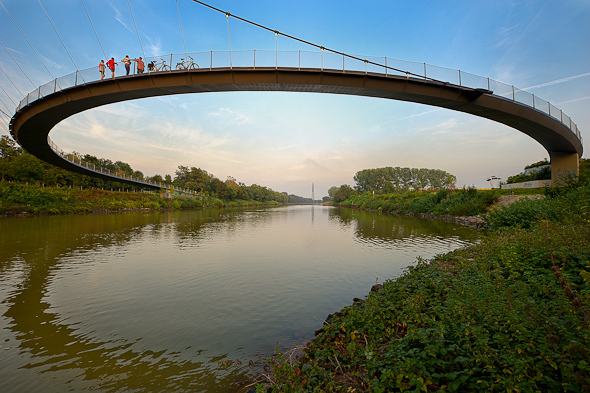 The bridge connects the recreation areas north and south of the Rhine-Herne Canal and connects the cycle path along the acient ore-railway-line with the cycle path within the Emscher Park. I awaited this moment with the men pausing on the bridge in the evening sun for about 2 hours. They did notice me photographing but did not bother about me. So I could capture a moment of friendlyness, informality and understanding with no posing towards me.